Welcome to the MySuper dashboard. Here, you will find the most up-to-date return and investment figures for First Super’s MySuper. You can then compare this with other MySuper products at ASIC’s MoneySmart website. The average return for the 10 years to 30 June 2018 was 6.46% p.a. Individual financial year returns are provided below. Your super account earns investment income at the Fund’s declared crediting rate. The crediting rate used will depend on the investment option(s) you have selected. More information about crediting rates can be found in the More About First Super booklet and the First Super Pension PDS. The actual returns are based on the performance of the underlying investments and First Super does not guarantee or promise any specific rate of return. Achieve an investment return (after tax and investment expenses) exceeding inflation, as measured by the Consumer Price Index, by at least 3.5% per annum over rolling ten-year periods. Confine the chance of the rate credited to members falling below zero in any financial year to less than one in eight. 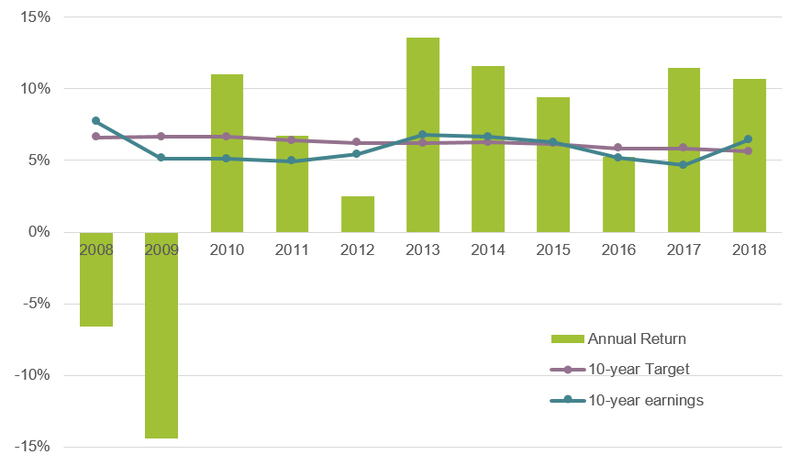 Achieve an investment return (after tax and investment expenses) exceeding the median of the SuperRatings Default Option Survey over rolling five-year periods. Estimate of fees and other costs for a member with a $50,000 balance who does not incur any additional activity fees. Investment fees and indirect cost ratios are an estimate based on the 2017/18 financial year. Fees charged in subsequent financial years will depend on the actual costs incurred in those years. Past costs may not necessarily be an indicator of future costs. The Standard Risk Measure allows you to compare investment options on the basis of investment volatility. The lower the risk band number, the less likely an investment option will deliver a negative return. The First Super MySuper product aims to have a lower risk band than the average MySuper option. The Australian Prudential Regulation Authority (APRA) requires all super funds use the Standard Risk Measure to grade investment options (see table below). it is not clear that there is sufficient reliable information to make a 20-year projection in circumstances that have, and continue to, emerge following the global financial crisis. If you require more information on how to pick the right MySuper fund for you, please visit the Money Smart website.